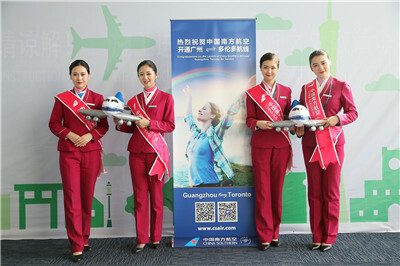 Toronto, Canada - December 7, 2016 - China Southern Airlines (www.csair.com) the largest airline in the People’s Republic of China, is pleased to announce the launch of new non-stop service between Guangzhou and Toronto. The new service will operate three times weekly and will be the first commercial service between South China and Toronto and is the second route operated by China Southern Airlines to Canada; the airline also operates direct service between Guangzhou and Vancouver. China Southern will use a Boeing 777-300ER on its new Guangzhou-Toronto service which can accommodate 309 passengers in a four-class configuration with four First Class, 34 Business Class, 44 Premium Economy and 227 Economy seats. 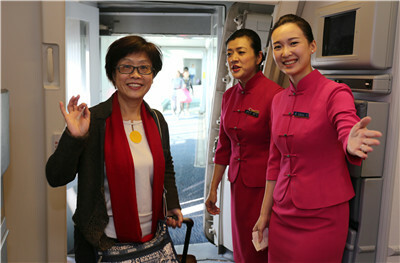 Passengers can enjoy a host of world famous Cantonese as well as International cuisine in-flight. Toronto-bound passengers may also take advantage of superior transfer services provided by China Southern Airlines at Baiyun International Airport Guangzhou, which allows a single ticket and one-stop check-in for the entire trip including baggage handling. China Southern Airlines and WestJet have signed a code-sharing agreement to assist arriving Toronto passengers flying to the other major Canadian cities, including Montreal, Ottawa, Edmonton and Calgary. China Southern currently operates up to 74 weekly flights between Guangzhou and numerous destinations in North America, including New York City, Los Angeles, San Francisco, Vancouver and Toronto. Currently, China Southern Airlines operates 700 passenger and cargo transport aircraft, including Boeing 787，777,747, 757& 737 and Airbus A380, A330, A321,A 320, A319. The airline fleet is ranked the first in Asia and the 4th in the world (Data : IATA, in terms of fleet size) .China Southern Airlines is the first airline in the world to operate both A380 and 787. China Southern Airlines has formed an extensive network with Guangzhou，Beijing，Urumqi and ChongQing as its hubs, covering all of China, radiating throughout Asia and linking Europe, America, Oceania and Africa, building an international network-oriented airline. China Southern operates more than 2000 daily flights to 208 destinations in 40 countries and regions across the world. Through close cooperation with its SkyTeam member airlines, China Southern’s network spans 1062 destinations to 177 countries and regions.